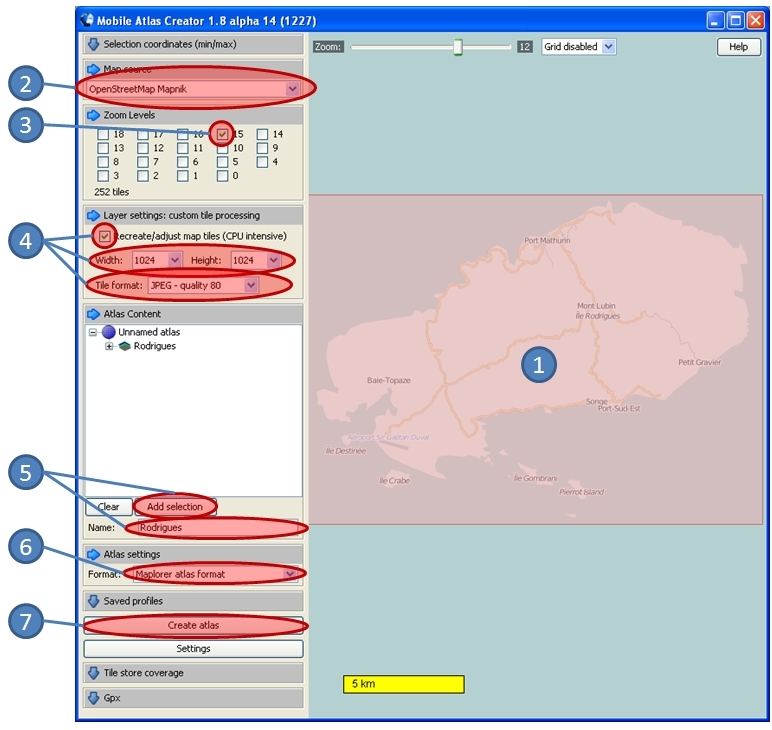 Currently the best and easiest way to make maps for Maplorer is the interactive application Mobile Atlas Creator. Version 1.8 alpha 14 now allows to automatically create Maplorer maps for any location. You can download it here. Select the region for which you want to create maps by dragging a rectangle (to find your region, you can use right-click to drag/pan, mouse wheel or the slider on top to zoom). Choose any map source; OpenStreetMap Mapnik is a good choice for hiking/biking, but any other will do. Select a zoom level. The bigger the level, the more detail you get. 15 is a good compromise for hiking/biking. Under Layer Settings, activate Recreate/adjust map tiles and choose a JPG Tile format. A good resolution for Maplorer is 1024x1024. Give your map collection a name and press the Add selection button. Under Atlas settings, choose Maplorer atlas format. Push the Create atlas button. Once all tiles have been processed, you can use the Open Atlas Folder button to see the result; open the subdirectory and copy all .pos and .jpg files to your device, in the Maplorer folder (the one where you stored maplorer.exe). Just start Maplorer on your device to automatically create the master map, and off you go! If for some reason you can not / do not want to use Mobile Atlas Creator to make maps, you can use the manual method described below. The explanation below uses maps from openstreemap.org, because it is open source (you can use the maps for free as you wish), but the concept works for any map you are able to display on your computer screen. Goto http://www.openstreetmap.org/ and display the map you want in your web browser. Display the map in your Web Browser. In Google Earth and most other sites/tools, just move the mouse to the corner and note the values displayed in the status line. NEW ! With Google maps you can use my handy Google Map Grabber. NEW ! You can use this tool to create the POS file. Note that you can specify coordinates in decimal notation (“6.965277778”) or degrees-minutes-seconds notation (“6d59'29”), whatever you prefer. The letter ‘d’ is used instead of the character ‘°’ to assure compatibility with all handheld devices.